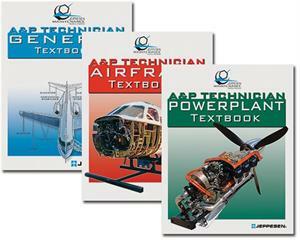 This combo package includes the Jeppesen A&P textbook bundle - set of all 3 textbooks (General, Airframe, Powerplant). Each of these textbooks, the General, Airframe and Powerplant textbooks, are revised, expanded, and updated edition fully integrates practical A&P skills with theory of the A&P general topic areas. It includes a wealth of colored illustrations and examples to help maximize the most from your study efforts. Each section includes comprehensive exercises that check the understanding of the material. The textbook introduces the fundamental concepts, terms and procedures that are the foundation of the more complex material that will be encountered in later maintenance training.